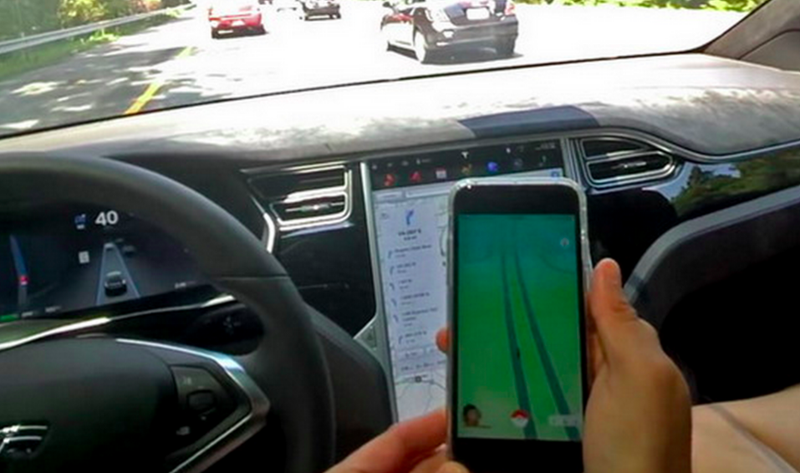 Today in bad ideas, a now-removed YouTube video of a man playing Pokémon Go while using his Tesla’s Autopilot mode has been making rounds on the interwebs. Though the clip is gone, we’ve still got the quotes from YouTuber Gary Zhou describing what it was like to simultaneously aim to catch Pokémon while riding in a car on Autopilot. There’s a way to play Pokémon Go when you’re driving, although you really, really shouldn’t. But what if your car is semi-autonomous? Does that make it okay to “catch ‘em all” while cruising down the freeway? Of course, the answer is “no,” because, as we learned from multiple recent Tesla crashes, there’s a huge difference between the public beta-stage Autopilot and a truly “self-driving” system. The way Teslas are designed today, drivers have to pay attention to the road and have their hands on the wheel— it can be the difference between life and death. But Zhou decided to try Pokémon Go anyhow, with both hands off the wheel, and his concentration focused squarely on his smartphone as the car barreled down I-95 near Washington, D.C..
For those of you who are not too familiar with some of the dynamics in Autopilot, one of the things I’ve noticed, I’m not sure exactly what the cutoff is, but I believe under 45 or 40 mph – as long as there’s a good amount of surroundings and clear lane markers as you can see here – it will never ask you to kind of, remind you to put your hands back on the steering wheel. Hopefully Zhou pulled down the video because he realized how idiotic his behavior was. The fact is, until cars are fully-autonomous, there’s really no good reason to look at a phone while in a driver’s seat of a moving car.